This burner in Curlew, Washington, has the perfect cone shape. 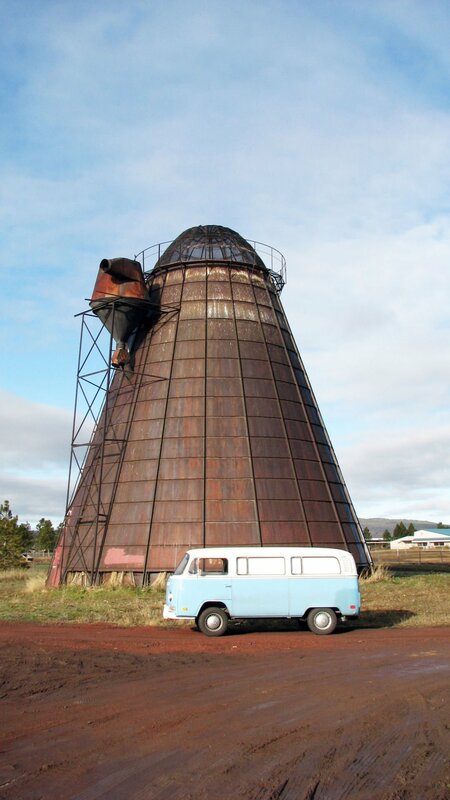 A large wigwam burner near Swisshome, Oregon. Ron Baldwin’s VW Bus is in the foreground. Heavy rust coats the wigwam burner at the former Beaver Lumber Co. sawmill site near Clatskanie, Oregon. The haunting form of the Seneca, Oegon waste burner at dawn. Inside the dome of a retired wigwam waste burner in Hood, Washington. In the 1970s, I befriended a Clatskanie man, Russel “Lee” Hall, who had many old-coot yarns about the natural and supernatural things around us. Being a former actor, singer and comedian, he couldn’t resist embellishing his stories with fanciful characters, spirits and all sorts of imaginary beings. According to Russel, Wigwam Man was born in a volcanic eruption long ago and confined to the “Underearth” by the North Wind until the Sawmill Men came along and threw up the Wigwams. When those things went up, Wigwam Man finally had a warm place on “Upperearth” to live. He even had warm places he could go and visit Upperearth, and he no longer had to remain in the bone-chilling climate of Underearth. No one ever saw him because he traveled at night and disguised himself as a fog. Russel continued: Wigwam Man traveled around and visited lots of places. He was happier than his wildest dreams, but it was for naught: Government Man came along one day and shut the burners down. Wigwam Man was aghast. “Where will I live? Where can I go?” he said. For poor, old Wigwam Man, it was devastating. He would forever be cold and lonely. I got to thinking about my old friend on the 25th anniversary of his own flight from Upperearth and decided to set off on a bit of a search for Wigwam Man. The wigwam burner was first developed and deployed by Colby Engineering of Portland in 1916, according to the Environmental Protection Agency. The industry quickly adapted to the cone-type burner, and by the 1930s most mills used some form of this design. This system remained the standard for sawmills for more than 45 years. The Clean Air Act of 1970 was the final stroke for the wigwam burner in America. By the mid-1970s, virtually all sawmill waste burners were quenched, but not all were torn down or removed. Most remained until development or the elements brought them down. An estimated 50 to 60 remain standing; there are still a few in Oregon and Washington. None are in operation. I piled my pack, cameras, computer and camping gear into my old VW bus and set off for Clatskanie, where the closest one stands. The rusty cone of the burner at the former Beaver Lumber Company millsite on Beaver Creek, just outside of Clatskanie, has been there all of my life. I remember as a boy passing the place in a car at night and watching the sparks fly from the top of the cone like what I imagined fireflies looked like (at that point, I had never seen fireflies). Of all of the cones I saw, this was the most complete. Sitting on its little island, it looks as if it could start burning tonight if it weren’t for one small detail: no mill. The bones of the Broughton Lumber Company still sit basking in the sun in Hood, on the Washington side of the Columbia Gorge. The former mill, which closed in 1986, is just west of Bingen/White Salmon. The wigwam burner stands overlooking the site like a giant metal bird with parts of its entrails hanging out. Most of the old millsite’s buildings are vehicle storage now. I went inside the cone to take photographs and could find no sign of Wigwam Man, but it gave me an idea of how these things worked: Build a big metal cone with a screen dome on top, duQmp all of your wood waste inside, start a fire. Most of the ones I visited once had a blower system to speed the combustion process and were fed by conveyer belts and blow lines (air-fed sawdust pipes). This mill was once widely known as the last sawmill to be fed by a flume — a long, winding water-filled trough that brought big timbers from the roughsaw mill in Willard, 4.5 miles away and 1,000 feet up. After a restful night in The Dalles, I set off for Eastern Oregon and two rumored burner sites that were gone without a trace. Wild goose chase. Locals pointed me south to a burner at Seneca, south of Canyon City. This one was a magnificent sight in the predawn light. Standing in a huge field all by itself, it dominated the entire scene. I crawled inside through a hole in the metal and stood looking up as I heard a kind of low, pulsing wind sound. Outside, as I walked around the structure, I began to roar with laughter. Standing before me, right next to the cone, was a cow about the size of a bulldozer with its head stuck through a hole in the metal skin. “Holy smokes, do I need some coffee?” I said as I stood outside in the morning mist, but it was not to be for another 60 miles. After another wild goose chase near Prairie City, I headed for North Central Washington, through the stark beauty of the Yakima and Colville Reservations. My destination was two wide spots in the road north of Republic called Malo and Curlew. These two burgs near the Canadian border each have a burner. One stands in a logging museum lot in Malo and was moved there from its original site. The other, on a narrow creek, was the most complete mill I found. It looked like they just shut off the power and walked away. The sun-worn sign said Brown Lumber Company. Wood smoke has always had a physical effect on me. I get nostalgic and my nose tweaks at the smell. I know some people are glad those old burners are gone, but I still have that nostalgic feel for them. It did me good to see that a few are still standing, and I’ll keep looking, but I shall not again encourage Wigwam Man to materialize anytime soon.